In response to Joey Schmidt’s recent post about Pumpkin Spice tiki drinks (and the general pumpkin spice craze that seems to hit everywhere around this time of year), we are re-posting this story from last fall that includes our Pumpkin Spice Sour. 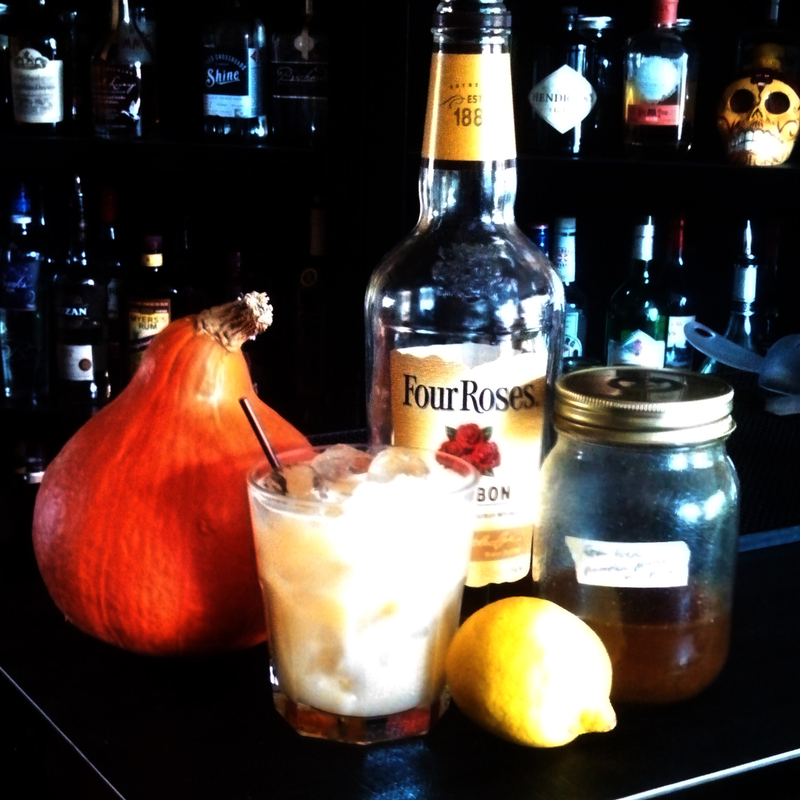 While seeking inspiration for the Fall Cocktails seminar we taught last week, we thought of three things we definitely wanted to use: Applejack, homemade Old Tom gin, and pumpkin. We’ve said before that we really enjoy using Applejack in our cocktails in the fall. For those of you who aren’t familiar, Applejack is technically a brandy made from apples, though it drinks more like a whiskey than a brandy. Before prohibition, Applejack and strong cider were the the primary products for which apples were grown. Applejack has been making a gradual comeback in recent years. The Laird’s company of New Jersey is the oldest and most prominent distiller of this product. Their 80-proof blended Applejack is the only variety available in here in Alabama. Out of state, you can get several others including our favorite, the Laird’s Bottled-in-Bond Straight Apple Brandy. There are also a few other companies that make similar products. In France, they make an apple brandy called Calvados, which is quite different in character from Applejack, but it is interesting to switch them out in recipes to see how they play with others. 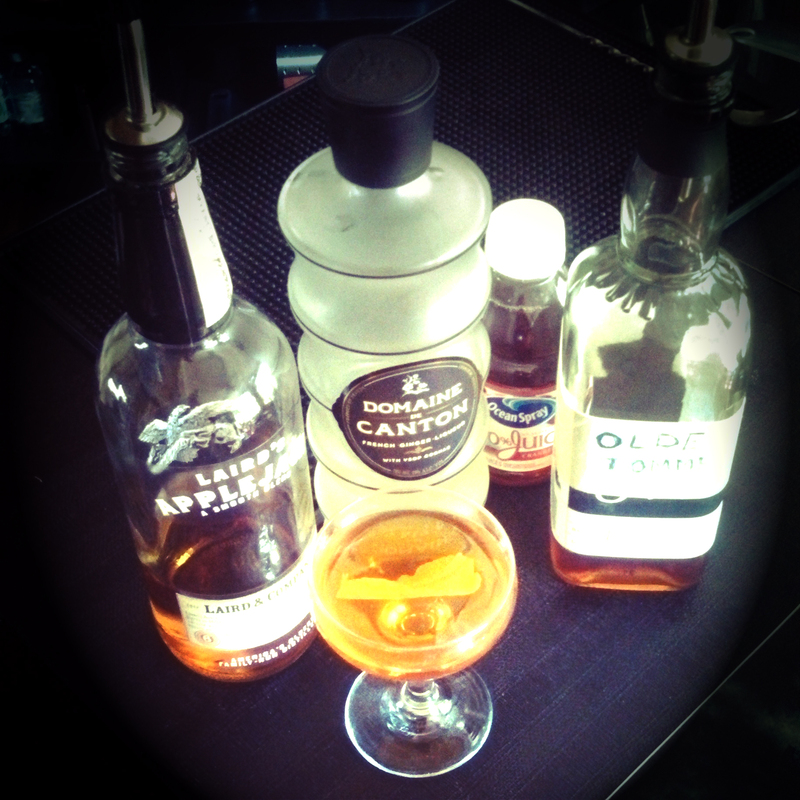 We paired the Applejack with an equal amount of our Old Tom, which you can find the recipe for here. We’ll spare you the “History of Gin” lecture here since you’ll get most of it if you follow that link. Our Old Tom is heavy with baking spices, especially cardamom and clove, with a hint of orange peel, making it an exquisite partner for the Applejack. We added Domaine de Canton ginger liqueur, a little cranberry juice, and bitters to round out the drink, which we decided to call Autumn Spice. Combine all ingredients in a mixing glass filled ¾ with ice. Stir to desired dilution. Strain into a coupe glass. Garnish with a lemon peel. We knew we wanted to make a pumpkin spice syrup. Everybody’s crazy about pumpkin spice these days, it seems. But unlike whatever is in your corporate cappuccino, we wanted to use actual pumpkin. We used a sugar pie pumpkin, baked the meat, and then pureed it in the blender. You can also use canned pumpkin puree, but where’s the fun in that? Add water and sugar to a small saucepan. Set over medium heat and cook, stirring occasionally until the sugar has dissolved. Add pumpkin puree and spices. Whisk to combine. Reduce heat to medium low for five minutes, whisking frequently. Remove from heat and let sit to cool. Pour the mixture through a fine mesh strainer or cheese cloth. Bottle and store in the refrigerator. We tried this syrup in a variety of drinks, but our favorite was a variation on a classic whiskey sour. Pour all ingredients into a shaker. Shake without ice until you feel pressure building in the shaker. Add ice and shake again. Strain into a rocks glass filled with fresh ice. For more Fall cocktails, see here, here, and here. In the fall, we lean a little heavier on the whiskey cocktails than other times of year. We also like to incorporate Applejack, a variety of apple brandy that is made like whiskey, except from apples. We prefer the Laird’s Bottled-in-Bond Applejack because the 100-proof tends to stand up better against the other ingredients. But you can’t get the Bottled-in-Bond (legally) yet in Alabama. You can sub the 80-proof Laird’s Blended Applejack, which is available at some ABC stores now. You might have to use a bit more of it to get the same effect. We also have on hand some 7 1/2 year apple brandy from Laird’s and Calvados, an apple brandy made in France, both of which are good for sipping. This one is a Manhattan-style cocktail with the applejack standing in for some of the whiskey. We also had some scuppernong juice in the fridge that seemed like it would be interesting. I think we got that at Whole Foods, so it shouldn’t be hard to find, but you could substitute regular grape juice, or just go a little heavier on the vermouth. Ramazzotti is an Italian aperitif liqueur (amaro) that adds a nice herbal element to the cocktail. If you don’t have any of that, some Bénédictine will do. The Galliano gives it some mild notes of vanilla and anise. We asked our friends on Facebook to name this one. It was Nancy G. who came up with the most fitting title, we thought.